The second year I taught the course, the midterm was on Hallowe'en, and I invited the TFs over to my house for dinner after we finished grading. 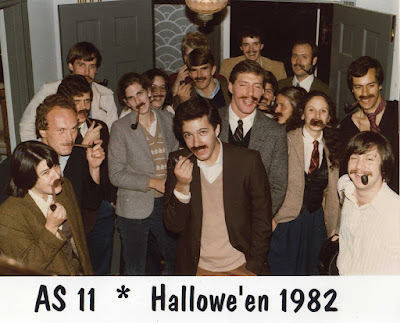 Margo Seltzer--now my colleague two doors down but then an undergraduate--arranged for everyone to show up with tweed jackets, mustaches, and pipes. (I still wear tweed jackets, but the pipe and mustache are long gone.) Here is the group photo, about which I blogged five years ago. A remarkable number returned for the Celebration of Computer Science on my 70th birthday. 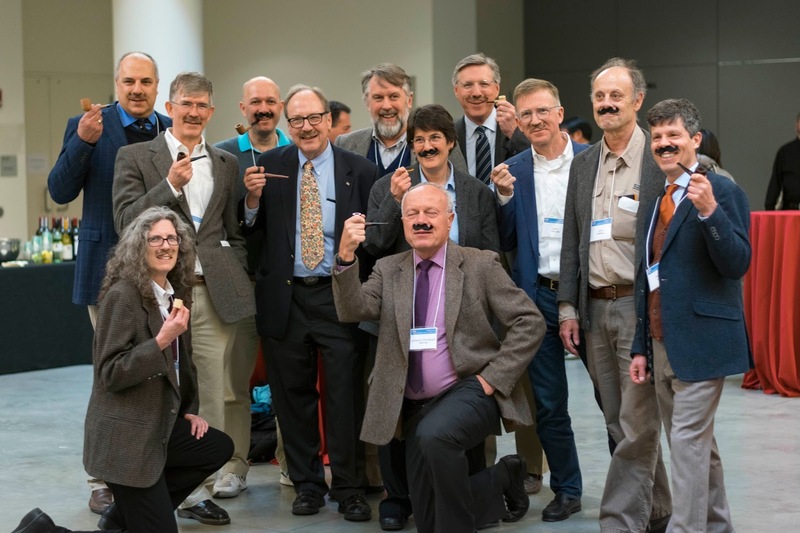 Left to right, Ted Nesson, Lisa Hellerstein, Phillip Stern, Michael Massimilla, HRL, Craig Partridge, Christoph Freytag, Margo Seltzer, Larry Lebowitz, John Thielens, John Ramsdell, Phil Klein. Rony Sebok also showed up, a few minutes too late to make it into the picture, and Larry Denenberg and boo gershun, who didn't make it into the original picture, were also at the event. So that is 14 of the original 23 came back 35 years after the fact (no more than 22 are still living). Sweet! I turned 70 on April 19. I made the decision some time ago to creep toward retirement around now. So I am giving up my role as Director of Undergraduate Studies in CS, a role I have had most years since even before there was a CS undergraduate major. I will be teaching half time for the next two years (I have already blogged about the cool new Classics of Computer Science course I will be teaching). I then have a year of saved sabbatical, so will transition to Research Professor or some such title on July 1, 2020. And Harvard Magazine has a nice report on the event. Thanks to everyone, and especially to Margo Seltzer, David Parkes, and Henry Leitner for their roles in putting this together. We were able to reproduce a facsimile of A 30th Anniversary Family Photo, which I will post when I get it. 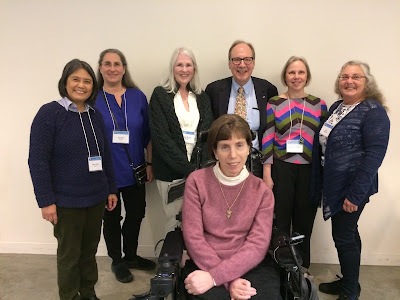 In the meantime, here is another classic -- six women computer scientists of the class of 1980 all came back for the celebration. That really means a lot to me! From left to right, Jeanette Hung, Jennifer (Greenspan) Hurwitz, Betty (Ryan) Tylko, Diane (Wasserman) Feldman, HRL, Christine (Ausnit) Hood, and boo gershun. Thanks! Harvard, the Crimson, and my family are all proud that Dave Fahrenthold '00 of the Washington Post has just been awarded the Pulitzer Prize for National Reporting, for his work investigating Donald Trump's charitable donations and for breaking the "Access Hollywood" video story. Dave is married to my daughter Elizabeth (see family photo). Before he met her, he covered me for the Crimson while I was dean. See this early example of his thorough, fair-minded work covering an uncooperative subject!